INTRODUCTORY RATES for this spacious brand new 58' Catamaran. Rates posted Summer / Winter 2011 are showing a 15% discount that is good for confirmed charters for any date except Christmas and New Years if booked before November 15th, 2011. After November 15, 2011 the summer and Winter 2012 rates apply. 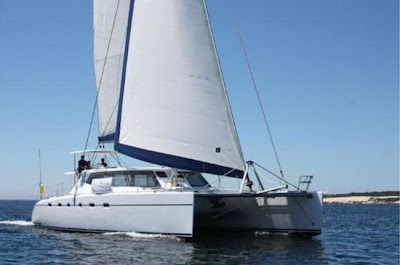 7 pax catamaran (8 pax for families). This is a catamaran of extreme luxury, featuring two King one queen cabins. The kings can convert to twins, and one has an additional single berth. All on suite. The design has allowed for a very spacious galley and saloon/ entertainment area. Double sided cockpit setee allows seating facing both fore and aft. Drop down blinds provide privacy and protection for outdoor dining and lounging in all weather conditions. We can also accommodate groups for day charters. Both king cabins can be converted to 2 individual twin beds by use of a partition. One King has a pullman berth. All cabins are ensuite with separate showers.